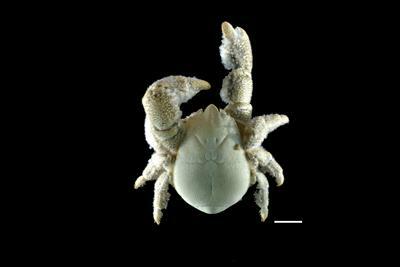 The first species of Yeti Crab from hydrothermal vent systems of the East Scotia Ridge in the Southern Ocean, Antarctica, has been described by a team of British scientists. The species Kiwa tyleri is named after world-renowned British deep-sea and polar biologist Professor Paul Tyler from the University of Southampton. Kiwa tyleri belongs to an enigmatic group of squat lobsters, known as Kiwaidae, that thrive in the hot waters surrounding the geothermally heated hydrothermal vents. It is the dominant species at these sites occurring at extremely high densities, exceeding 700 specimens per square metre. This Yeti Crab is famous for its body, which is densely covered by bristles - known as setae - and bacteria, giving it a fur-like appearance. Kiwa tyleri’s appearance allows it to harvest the dense bacterial mats, which overgrow the surfaces of vent chimneys, on which it depends on for food from the chemosynthetic bacteria. 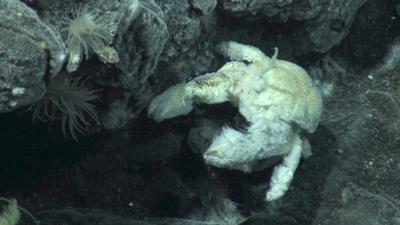 For most of its life, Kiwa tyleri is trapped within the warm water environment of the vent chimney (up to about 25 degrees Celsius) and is unable move between vent sites because of the hostile, low temperature (about zero degrees Celsius), polar environment in between. Females carrying eggs only move away from vent chimneys, and into the surrounding polar deep-sea, in order to release their larvae; these would otherwise not survive the warmer temperatures of the adult habitat. Crabs and lobsters, which are a characteristic of the global oceans, show an extremely low species number in polar seas. 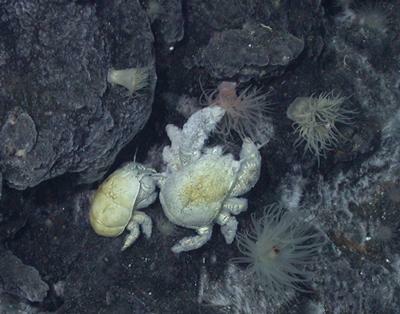 Hydrothermal vent systems found in the Southern Ocean, therefore, present a unique warm-water refuge to Yeti Crabs. This work was supported by a National Environment Research Council (NERC) (UK) Consortium Grant (“CHESSO”) (NE/D01249X/1), and the Total Foundation (“ABYSS2100”) (France).